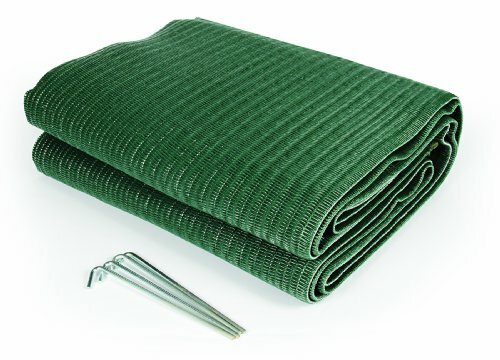 Camco Green RV Reversible Awning Leisure Mat is a 6’ x 9’ mat that cleans easily with soap and water. Made of durable, mildew resistant materials, with rust resistant grommets and ground stakes included. Reversible woven design allows snow and rain to drain through mat. Help keep dirt from being tracked into your RV. Also useful for picnics and beach outings.